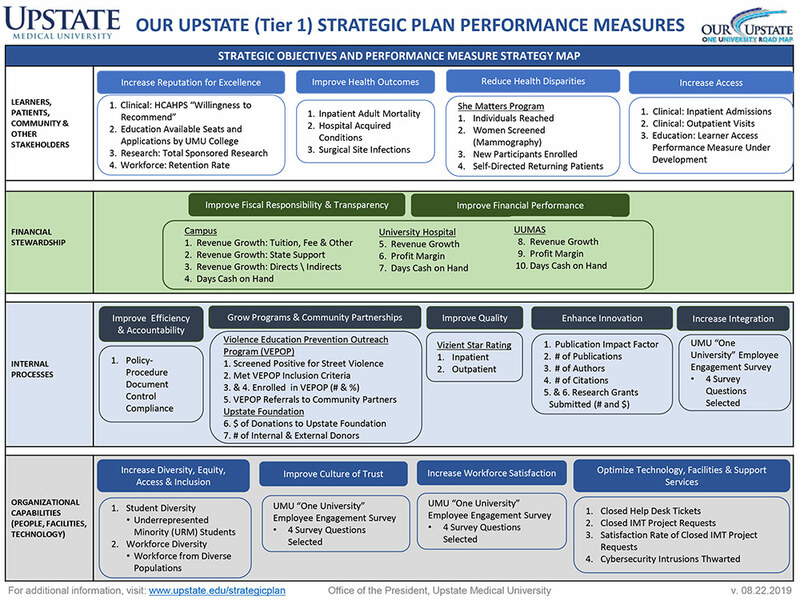 The OUR Upstate—One University Road map—Tier 1 strategic plan performance measures represent progress on our organizational objectives; priority areas of continuous improvement. All performance measures relate to the intended results of the strategic objectives, and therefore may be best represented by a multi-mission (education, biomedical research and clinical), programmatic, financial or operational metric. Multiple criteria were considered in the selection process, with a specific emphasis on: Breadth of Measure; Balance across Education, Research, and Clinical; and Important to Institution-wide Mission and priorities. On behalf of Strategic Affairs, Office of the President, we extend our appreciation to the numerous data providers associated with these measures. Last Modified: July 13, 2018. Contact Renee M. DeVesty with questions about the content of this page.